It’s nice to be here this-evening after a few weeks absence. It turns out that there is a partial tap takeover tonight by Denmark’s Alefarm brewery. Brew By Numbers - Pilot Series: Sour Ale with Raspberries 6.40 Bright red in colour. Tart. Lots of raspberries. Alefarm - Cinder 7.20 A murky gold IPA, sweetened with lactose. Amarillo, Mandarina Bavaria and Citra hops. Both milky sweet and bitter fruit hoppy. Brew By Numbers - 27/01 DDH Table Pale: El Dorado & Citra 3.50 Low strength but exceptional hop levels. Pineapple. Alefarm - Forlorn 5.50 Cloudy gold with a hard mouthfeel. Ekuanot and Amarillo hops. Bitter finish. I met Robert S here for the Nevel Tap Takeover – good practice for our forthcoming visit to the Netherlands. Nevel are a wild yeast brewer a bit like a Belgian Lambic brewer and blender – and some of the beer is a bit challenging. Third pint tasters all the way tonight. Brew By Numbers - 42/04 DDH Pale Ale Number 4 5.80 Served by ‘Nitro’ which used to be a dirty word amongst beer drinkers. Technically it is not available until tomorrow (and I might have to update the ABV then as I am guessing today). Incredibly fresh and hoppy and fragrant and lovely. Nevel Artisan Ales - Loof 5.60 A barrel-aged and blended version of Pril using old red wine barrels that impart only a little woodiness to the beer. Has a much more rounded and mellow flavour and mouthfeel. Nevel Artisan Ales - Purper 4.40 Complex. A Grisette, brewed with buckwheat and flavoured with lavender and sour aronia berries. After a lot of consideration I decided it was lovely. Nevel Artisan Ales - Pril 5.30 A very dry Pale Ale brewed with Brettanomyces. I thought it was a little sour, but brewer Vincent just about persuaded me that I was confusing dryness with sourness. Nevel Artisan Ales - Alm 5.50 Strictly-speaking this is Alm Batch 3, as Vincent told us every brew would be a little different due to the varying action of his wild yeast. Murky old gold in colour. This is a Saison brewed using Mugwort and Wormwood. Sharp, bitter and subtly herbal. Nevel Artisan Ales - Bries 6.20 A barrel-aged beer flavoured with Sea Buckthorn. Quite acidic. Nevel Artisan Ales - Erve 5.50 The only beer of the evening with significant carbonation. This is a hazy golden Saison that contains hops (Goldings). Nevel Artisan Ales - Noest 4.90 A disappointing, slightly sour Porter that I thought was too thin. I’m not breaking much new ground along the Bermondsey Beer Mile as I find myself unable to walk past this tap for what I consider to be one of the very best breweries in London. It is jammed full tonight. Brew By Numbers - 01/34 - Saison: Passionfruit & Coconut 4.00 Yum. This is great. Lots of passionfruit with a bit of dry coconut in the background. Brew By Numbers - 65/02 – DDH India Pale Ale: Number Two 6.80 Filthy yellow murk. All lipids and proteins and hops. Ægir - Norwegian Farmhouse 4.60 From keg. Unexpectedly brown in colour. A bit rough and rustic. Day two on the Bermondsey Beer Mile and it’s a rare Saturday afternoon venture for me. I’m surprised to discover that not only is the Beer by Numbers Tasting Room open, but so is the old bar in the brewery itself a couple of doors away. Pubs & Beer website is going to have to make do with the two venues being intertwined in the listing here. I drank beer in both parts. Brew By Numbers - 05/32 India Pale Ale: Loral Amarillo Ekuanot 6.20 Golden and murky. Fresh and fruity. Brew By Numbers - 03/07 Porter: Baltic 9.00 It’s probably too early in the day for such rich, strong loveliness. La Nébuleuse - 42/1020 5.00 A Swiss brewery collaboration from keg. This is a kettle-soured NEIPA. Perhaps it is a style that will grow on me. Early evening and it is very crowded in here. Brew By Numbers - 03/03 – Porter: Traditional 6.60 Black and creamy and roasty. Dry, coffee flavours. Brew By Numbers - DDH 5th Anniversary Pale Ale 5.50 Crikey, 5th anniversary – doesn’t time fly. DDH stands for double dry-hopped and this beer has even more hop character than usual for BBN – Mosaic, Simcoe, Wai-iti, Galaxy and Citra forming the hop bill. Murky gold in colour. Brew By Numbers - 70/01 – Double Red: Citra, Centennial & Loral 8.50 A collaboration brew with Cloudwater. Murky reddish amber. Alcohol strength dominates, malt and hops follow. I have been guilty of failing to add updates on all of my visits to this fine Taproom. This was how I found it last Friday evening. Brew By Numbers - 20/02 Belgian Pale: Ella & Saaz 4.50 Yellow/gold in colour and hazy. Good hops. Spicy Belgian yeasty tastes. Brew By Numbers - Pi/13 Pilot Series: Peach Pale Ale 5.80 A special beer produced for Manchester’s Indy Man Beer Con. It is a thick, golden beer. It certainly has peaches in it. Lost and Grounded - Autumn Saison 5.60 Amber-coloured (autumn leaf-coloured in fact). Unusually for a Saison, this has a predominately malt taste, with some spiciness from rye. A little bit tart. Brew By Numbers - 05/26 IPA: Citra & Ekuanot 6.50 Cloudy yellow/gold. Perhaps notthe best hop combo ever, the Ekuanot seemingly bluntingthe Citra. Still pretty lush though. Tonight was to be the night that Brew by Numbers opened its new, larger, purpose-built tap room, a few doors (arches) down from the present place. But it wasn’t quite ready and a hasty, make-shift bar opened at the usual site with just four tap beers, around 20 minutes after the usual opening time. Brew By Numbers - 10/09 Coffee Porter: Beyene 6.00 A black beer with a brown head. A full-flavoured, strong Porter. Brew By Numbers - 16/07 Red Ale: Amarilla Citra Simcoe 5.40 To my taste buds, this is the perfect Red Ale. Us-style. Almost no sweetness, lots of hops. Early evening. The weather is glorious and there are a lot of people around. Brew By Numbers - 05/22 India Pale Ale: NZ Mosaic & Columbus 7.30 From key-keg. Murky pale gold. Superb hops. Brew By Numbers - 18/06 Farmhouse – Pear Saison 6.00 From key-keg. A thick, yellow coloured beer. This is a bit bonkers really. Tart pear flavour. In a blind tasting, I might have had it down as a rather rough Perry. Early evening, with plenty of people visiting this brewery today. I enjoyed a pork steak with chips and gravy, as well as the beer. Brew By Numbers - 05/11 – India Pale Ale: Citra & Mosaic 6.20 Citra and Mosaic – you can’t go wrong there. Brew By Numbers - 11/25 Session IPA: Citra & HBC 431 4.20 Golden and murky. More lovely Citra. Brew By Numbers - 20/05 Belgian Pale: Motueka & Saaz 4.50 A cloudy pale gold colour. Euro hop flavours and a definite Belgian twang. We regroup in here after our brave exploration of new breweries in London’s nether regions. Brew By Numbers - 01/08 Saison – Wai-Iti & Lemon 6.20 From key-keg. Very lemony. Brew By Numbers - 21/09 Pale Ale: NZ Cascade & Pacifica Jade 5.50 From key-keg. A cloudy yellow/gold colour. Very fruity and very good. Brew By Numbers - 05/22 India Pale Ale: NZ Mosaic & Columbus 7.30 From key-keg. Piney and fruity and murky and a bit herbal. The pub is found in Bermondsey, Central London, SE16 3RA. 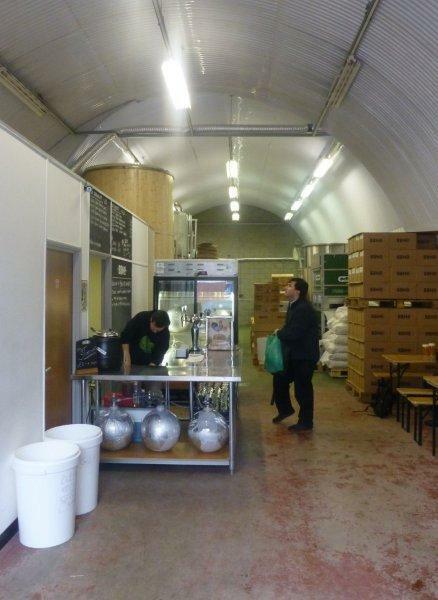 A Bermondsey micro-brewery established in late-2012. The majority of production is bottled, with an increasing amount going in to key-keg. 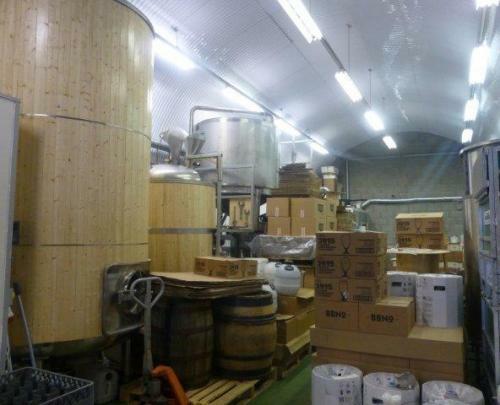 The brewery is situated in two railway arches and has an expanded bar area which opens between 11am and 4pm on Saturdays, as well as on Friday evenings. All beers are numbered, the numbers representing the style followed by the recipe. So, 02/04 would be style number two (Golden Ale), recipe number 4. We have visited this pub 26 times, seen 69 different beers and tried them all.